We are estatic, and it's been fun to see the reactions of the Moroccans. Yesterday (Tuesday), as we were walking around the medina, people would shout out Obama's name. Today, I have been wearing my Obama/Biden button on my shirt (it's been on my purse until now, but sort of hidden), and SO MANY people, from the hotel workers, to the shop keepers, to the people sitting in the medina, have all smiled and their eyes light up. I've had numerous requests for the button, or if I had extras, and I wish I did! The Moroccans are very excited for change, not just for how it will effect their country but also for Americans. They understand that the direction our country has taken in the past eight years is not the will of the American people; they know the goodwill this country has undertaken in the past, and look for that to return, and not to continue the wars that Bush has gotten us into. It's been gratifying to support a positive change, and to be able to hold your head high while walking the Marrakech streets. Computer problems..... the flash drive where I have been writing my posts and downloading my pictures to is now not being recognized by the laptop. Don't really have a clue as to what's wrong with it, but I have two posts on there, that I now can't get on here. In short, we had the most wonderful experience in Fes. We were invited to the home of our guide, Abdesalem, as his wife, Aicha, and family prepared a traditional meal for us. We had pastilla, also known as pigeon pie, though this was made (as it is commonly) with chicken. 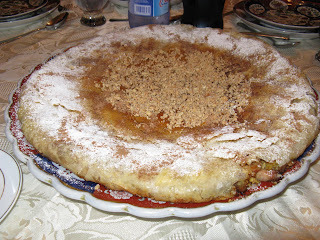 It's phyllo dough, with cooked chicken, mixed with ground almonds & walnuts, cinnamon, cloves, a touch of sugar; it is one of your traditional sweet & savory Moroccan dishes, particularly known as a specialty of Fes. This was FANTASTIC. It had the sweet & savoriness, crispness from the phyllo, tender chicken, I really can't say enough about it! 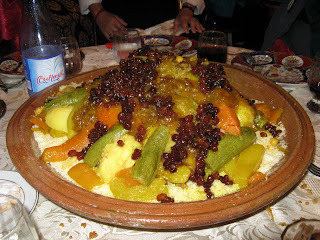 They also made a traditional couscous (which we've only had once until now) with lamb and vegetables. It too had some sweet & savory elements with the tender lamb and golden raisins, and it too was terrific. We were seated at three tables in their living room and hallway, and they made 3 of each of these dishes for each of the tables, and they have a tiny kitchen! 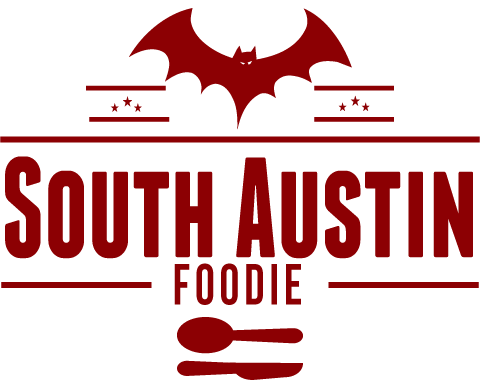 The food & hospitality we received was absolutely fantastic; it is by far the best meal we have had while we've been here. 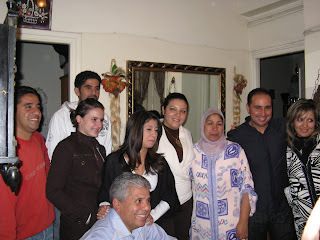 My special thanks to Zahra, one of Abdesalem's daughter-in-laws, who lived in the US for a couple of years. I sat next to her during dinner, and she answered my questions about the food. It was a great evening, and all of us thank them for it! Monday morning was cloudy and a bit rainy leaving Fes. We headed south for the Middle Atlas mountains, and the drive south. About an hour south of Fes, we stopped in a small town that was built in the late 1920s for French expatriots; it's even modeled after an alpine village. And true to form, it snowed a bit! Continuing down the road, we made a quick stop to see the Barbary apes, who, though wild, are fairly tame for the tourists. Also known as a type of macaque, they were rather entertaining! After cedar forests and more rain, we had a very late lunch at a roadside gas station, that served very good tagine and kefta (like a grilled meatball). Onto a small town with a tourist hotel for one night. 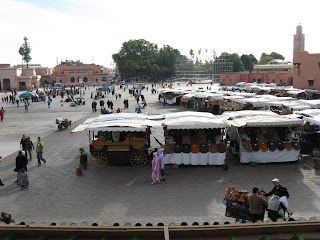 Tuesday morning, we continued the drive into Marrakech, and arrived in time for lunch just off the main plaza in the medina, called the Djemma. 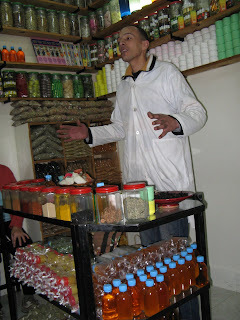 We then got to tour the medina, which is vastly different from Fes. Basically, think medieval vs. modern. It's very easy to get around without a guide here; people are friendly, and I've had no sense of personal danger like pickpockets that I've felt in other countries; it's comfortable. I didn't sleep super-well last night, I think in anticipation of the election results. We turned on the tv at 6:30 am (1:30 am EST), and after a couple of commercials on CNN, saw the results we wanted! There was much rejoicing at breakfast, and we SHOULD have had mimosas! We went to some beautiful private gardens, a couple of museums, an herbalist shop where we all got the hard sell (it worked! ), and then we were turned loose for lunch & time to ourselves. Mom and I went back into the medina, wandering through the different souks as the locals called out Obama's name. 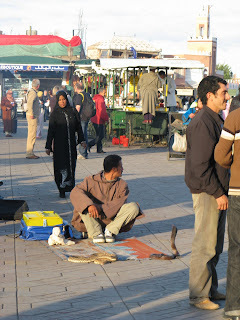 And not to be forgotten, the snake charmers sit on the plaza, waiting for tourists. I MISS MOROCCO!!!!! Seeing these pictures and reading your words only makes it worse! Thank you for sharing this!!!! !